The Elkhorn Primitive Baptist Church is having their annual church homecoming on Saturday, May 25 and Sunday, May 26. Organizers of the event said the celebration is in its 36th year and will kick off with the Elkhorn School Reunion Picnic at 11 a.m. Blues great B.B. King was a student at Elkhorn when he lived in Kilmichael and has attended class reunions in the past. 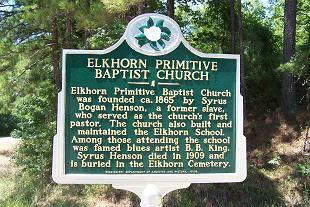 A historical blues marker on Highway 413 acknowledges King’s ties to the church and the school, as well as to its founder, former slave, Syrus Bogan Henson. Elkhorn Primitive Baptist Church was founded more than 138 years ago and many of Henson’s descendants still attend the church. A man accused of pointing a gun at authorities who were searching his house for a fugitive is asking a judge to grant him bond. Royce Funchess has been held without bond since being arrested at his house Aug. 7, 2012. Authorities were searching his house for Robert Lee King, suspected of fatally stabbing his ex-girlfriend and wounding her daughter in Memphis, Tenn., in 2005. Marshals say they arrested Funchess after he pointed a gun at an agent. King, who was on the Marshal’s most wanted-list, was not in the house. A mistrial was declared May 1 in Funchess’ trial after the jury couldn’t reach a verdict. A new trial is July 22. Funchess lawyer says his client initially thought the officers were burglars breaking into his house. Oktibbeha County supervisors have passed a resolution to let the public know it will borrow $5 million when needed to support an economic development opportunity. Supervisors took the action at the urging of the Golden Triangle Development LINK, a local economic development group. Local residents will have until 10 a.m. June 3 to submit petitions calling for an election on the issue. Officials say the county is more likely to attract major developments if spending authority is in place as an incentive if a large company wants to locate in Oktibbeha County. Joey Deason, Oktibbeha County’s representative with the LINK, says the city of Starkville will be asked to make a similar commitment. The money will be used to acquire land, update infrastructure and construct facilities. A federal judge has ordered a Tupelo man to undergo a psychiatric evaluation over a threat to shoot people at a local hospital. WTVA-TV in Tupelo reports that 24-year-old Cortavius Javon Hampton is accused of making the threat to federal court officials while talking to them over the phone about the status of a case he had filed against the North Mississippi Medical Center. According to an indictment handed down in March, authorities say during the conversation, Hampton stated he felt no one was listening and he would have to get a gun, go to the hospital and shoot some people. A judge granted a request from Hampton’s attorney for the psychiatric evaluation because Hampton was unable to assist with the preparation of his own defense.